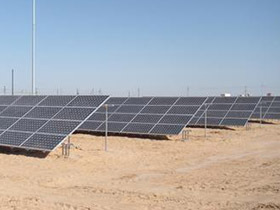 Wilson Electric was selected by McCarthy Building Companies for the large scale Arizona Public Service (APS), Red Rock Solar project in Pinal County. Construction on the project began in March 2016 and completed in December 2016, with the official dedication held on January 11, 2017. 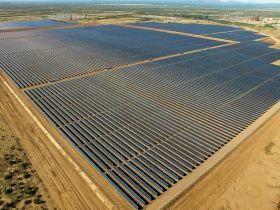 Located on 400 acres at 25990 E. Camino Adelante Road in Red Rock, Ariz., about 30 miles south of Casa Grande, this project represents APS’s largest solar plant to date with 2,286 single-axis trackers supporting 182,880 photovoltaic panels generating 40 megawatts (MWac) of solar energy. 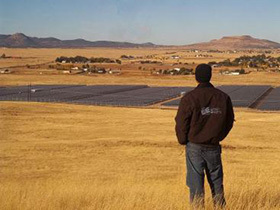 The solar plant supplies power to 10,000 homes. APS developed, owns and operates the plant. Wilson Electric's Design-Build Solar team installed a 2.2 MW solar system at fourteen APS interconnects and ten recreation centers across Sun City: an active adult retirement community west of Phoenix. Only one location received a roof-mounted system. Our design developed solar shade structures complementary to each location's space to house the necessary number of solar modules. 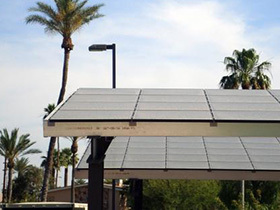 These solar shade structures provide coverage over the parking lots and some pedestrian areas. For Sun Edison/APS, the 20MW single axis tracking plant mirrored a similar design we executed in Prescott as well, which was 10 MW. Chino Valley was honored as an Energy/Industrial "Award of Merit" in ENRSouthwest's 2013 Best Projects Award. Direct with Blue Oak Energy as Designer and General Contractor, we installed equipment furnished by First Solar, providing DC and AC wiring including medium voltage to the existing 15 kW switchgear. Our team was responsible for the medium voltage, 4.12 megawatt installation expected to produce 305 kW. At its peak, the site had over 80 employees to meet high productivity standards in a tight 20-week schedule. 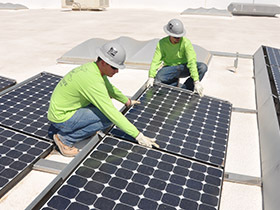 Over 1100 modules were installed each day on the 29-acre roof. The project was completed in November 2012. The San Luis Border Station is 44,480 SF and controls both primary and commercial inspections. The border station also has exit and export control and hazardous material dock and hazardous material isolation. The solar panels are placed throughout the site producing 25kW of energy with DC Photovoltaic Array. 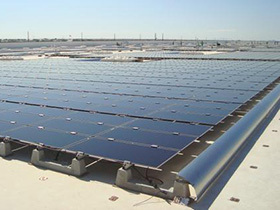 One of the largest solar systems on a commercial office building in Arizona, 4,508 solar modules are mounted on the roof and carports of Prudential's Scottsdale, AZ office. The 1,000 kW system is expected to produce an annual output over the next 20 years to offset 22,000 tons of greenhouse gas emissions. Completed in 2011, the custom design was contracted direct-to-owner with Wilson Electric as prime. Our Solar Design team worked closely with Prudential's corporate office in New Jersey to ensure a number of aesthetic specifications were met. As the building was in operation concurrent with construction, scheduling was completed in phases to ensure safety and limited obstruction.